Drum corps fans will have the opportunity to see nearly every World Class corps in action this weekend, as well as a number of Open Class corps, when DCI Live! returns with two concurrent webcasts on Saturday, July 11. 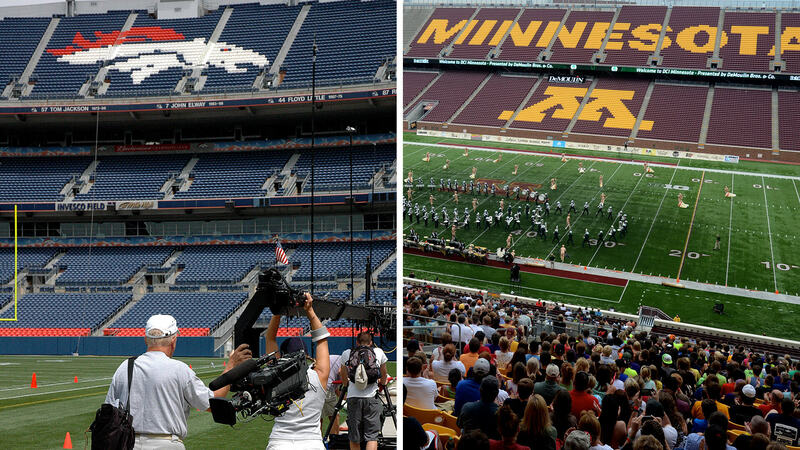 DCI Minnesota will step off from the University of Minnesota's TCF Bank Stadium at 4:30 p.m. ET/1:30 p.m. PT. Later, Drums Along the Rockies will begin at Sports Authority Field at Mile High in Denver at 8:30 p.m. ET/5:30 p.m. PT. PLEASE NOTE: This DCI Live! webcast will be available for viewing primarily on desktop computers. Mobile streaming is available through the DCI.org iPhone app, with the anticipated launch of brand new custom mobile apps designed for the Android phone and iPad in the coming weeks by mobile game development company. Both webcasts can be accessed as part of a season-long subscription package or pay-per-view. Santa Clara Vanguard will meet up with the Cadets and Carolina Crown for the first time this season, and with the Blue Devils also in the mix, four of the highest-scoring corps in 2015 will be at TCF Bank Stadium Saturday night. The Blue Devils will look to continue their undefeated season, but with tight scores across the board in recent events, the Devils will no doubt have their eyes on the competition in their rearview mirrors. Several corps have spent the past week away from the competitive circuit while they polish their productions. The Cadets and the Boston Crusaders haven’t competed since last Sunday in Clifton, New Jersey. Both corps were gaining significant ground in the standings before their week off. Both East Coast groups will no doubt be looking for a surge in scores thanks to the extended rehearsal time. Regional rivalries resume on Saturday when the Cavaliers and Phantom Regiment meet up again, while the Blue Stars and Madison Scouts rendezvous for the 11th time this season. The Cavaliers topped Phantom Regiment by just over three points in their first meeting of the season, but the Rockford corps cut that lead in half two days later in Whitewater, Wisconsin, and will look to continue gaining ground in Minneapolis. Meanwhile, the two Wisconsin corps have gone back and forth all season, with neither gaining a significant upper hand. The Scouts maintained a slim lead of 0.70 on Thursday night in La Crosse, Wisconsin, but anything could happen in Minneapolis. DCI Minnesota will also feature a strong lineup of Open Class corps. Legends has gone undefeated since dropping its first contest of the season, but Music City has steadily cut into the Michigan corps' lead. The Louisiana Stars made a strong start to their second Open Class season on Wednesday in Fort Wayne, Indiana, while River City Rhythm in its inaugural season will perform for a hometown crowd on Saturday. The Blue Knights have been on fire, blazing their way through the Rockies as they closed in on their home show in Denver. Coming into the month of July with a score of 72.40, BK quickly gained seven points and now sits at 79.400 with a chance to become the sixth corps to break 80 points in 2015. The Bluecoats were the fifth corps to break 80, doing so on Tuesday night in Waukee, Iowa. Since then, they’ve been trekking to the Rockies, making a stop Friday night in Casper, Wyoming. It will be the first time the Bluecoats and Blue Knights meet in 2015, and if the Blue Knights remain hot and draw a little extra energy from the home crowd, they might have an outside chance of beating the Bluecoats for the first time since 2000. There’s a logjam in the middle of Denver’s lineup, with the Troopers, Colts, Academy, Spirit of Atlanta and Pacific Crest all jostling for position while the Oregon Crusaders also try to sneak into the pack. The Troopers galloped out to a big lead on Thursday night, but the other four corps are hot on the Wyoming corps' spurs. Winning the race between these corps is important, as they eye a spot among the top-12 corps at the World Championship Finals in a very competitive season. If you have a second screen, Saturday night’s the time to break it out. With two stellar lineups in Minneapolis and Denver, you won’t want to miss a second of the action on DCI Live!